Issuing government debt reduces the risk of inflation arising from deficit spending because the private sector has less money to spend. When the government matches it deficit with new debt issues the non-government sector wealth rises. This answer is complementary to that provided for Question 1 and relies on the same understanding of reserve operations. So within a fiat monetary system we need to understand the banking operations that occur when governments spend and issue debt. That understanding allows us to appreciate what would happen if a sovereign, currency-issuing government (with a flexible exchange rate) ran a budget deficit without issuing debt? The question lures you into thinking it is the bond-issuance that drives the rise in non-government wealth when, in fact, it is the budget deficit that adds to non-government wealth irrespective of whether bonds are issued or not. This means that there are likely to be excess reserves in the “cash system” which then raises issues for the central bank about its liquidity management as explained in the answer to Question 1. But at this stage, M1 (deposits in the non-government sector) rise as a result of the deficit without a corresponding increase in liabilities. In other words, budget deficits increase net financial assets in the non-government sector. If net exports are running at 2 per cent of GDP, and the private domestic sector overall is saving an equivalent of 3 per cent of GDP, the government must be running a surplus equal to 1 per cent of GDP. The correct answer is that the government must be running a deficit equal to 1 per cent of GDP. This question tests your knowledge of the sectoral balances that are derived from the National Accounts. where Y is GDP (income), C is consumption spending, I is investment spending, G is government spending, X is exports and M is imports (so X – M = net exports). where S is total saving and T is total taxation (the other variables are as previously defined). Then you can convert this into the familiar sectoral balances accounting relations which allow us to understand the influence of fiscal policy over private sector indebtedness. 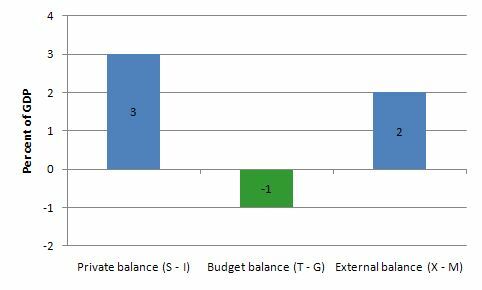 The sectoral balances equation says that total private savings (S) minus private investment (I) has to equal the public deficit (spending, G minus taxes, T) plus net exports (exports (X) minus imports (M)), where net exports represent the net savings of non-residents. Another way of saying this is that total private savings (S) is equal to private investment (I) plus the public deficit (spending, G minus taxes, T) plus net exports (exports (X) minus imports (M)), where net exports represent the net savings of non-residents. Thus, when an external deficit (X – M < 0) and public surplus (G – T < 0) coincide, there must be a private deficit. While private spending can persist for a time under these conditions using the net savings of the external sector, the private sector becomes increasingly indebted in the process. Given the construction (G – T) a positive number (1) is a deficit. The outcome is depicted in the following graph. This tells us that even if the external sector is growing strongly and is in surplus there may still be a need for public deficits. This will occur if the private domestic sector seek to save at a proportion of GDP higher than the external surplus. The economics of this situation might be something like this. The external surplus would be adding to overall aggregate demand (the injection from exports exceeds the drain from imports). However, if the drain from private sector spending (S > I) is greater than the external injection then the only way output and income can remain constant is if the government is in deficit. National income adjustments would occur if the private domestic sector tried to push for higher saving overall – income would fall (because overall spending fell) and the government would be pushed into deficit whether it liked it or not via falling revenue and rising welfare payments. A nation can export less than the sum of imports, net factor income (such as interest and dividends) and net transfer payments (such as foreign aid) and run a government surplus of equal proportion to GDP, while the private domestic sector is spending less than they are earning. A nation can export less than the sum of imports, net factor income (such as interest and dividends) and net transfer payments (such as foreign aid) and run a government sector surplus of equal proportion to GDP, while the private domestic sector is spending more than they are earning. A nation can export less than the sum of imports, net factor income (such as interest and dividends) and net transfer payments (such as foreign aid) and run a government sector surplus that is larger, while the private domestic sector is spending less than they are earning. The correct answer is the second option – “A nation can run a current account deficit accompanied by a government sector surplus of equal proportion to GDP, while the private domestic sector is spending more than they are earning”. Note that the the current account is equal to the trade balance plus invisibles. The trade balance is exports minus imports and the invisibles are equal to the sum of net factor income (such as interest and dividends) and net transfer payments (such as foreign aid). So the question is asking about a current account deficit. This is a question about the sectoral balances – the government budget balance, the external balance and the private domestic balance – that have to always add to zero because they are derived as an accounting identity from the national accounts. See the explanation in Question 3 for background. The following Table represents the three options in percent of GDP terms. To aid interpretation remember that (I-S) > 0 means that the private domestic sector is spending more than they are earning; that (G-T) < 0 means that the government is running a surplus because T > G; and (X-M) < 0 means the external position is in deficit because imports are greater than exports. B: A nation can run a current account deficit with an offsetting government sector surplus, while the private domestic sector is spending more than they are earning. So Option A says the private domestic sector is saving overall, whereas Option B say the private domestic sector is dis-saving (and going into increasing indebtedness). These options are captured in the first column of the Table. 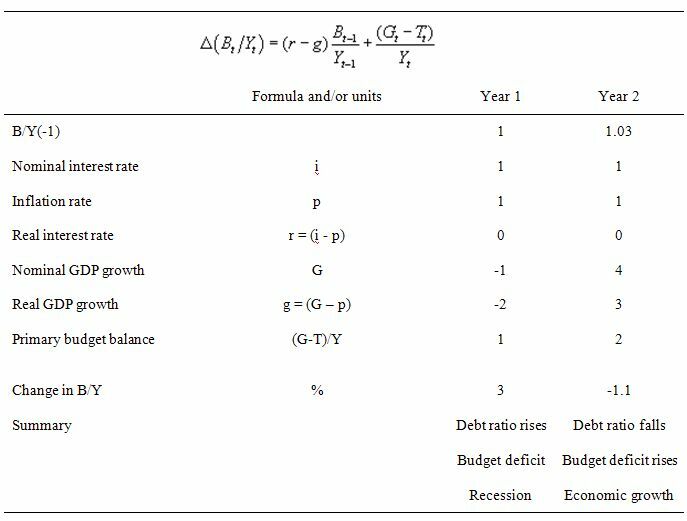 So the arithmetic example depicts an external sector deficit of 2 per cent of GDP and an offsetting budget surplus of 2 per cent of GDP. C: A nation can run a current account deficit with a government sector surplus that is larger, while the private domestic sector is spending less than they are earning. D: None of the above are possible as they all defy the sectoral balances accounting identity. It cannot be true because as the Table data shows the rule that the sectoral balances add to zero because they are an accounting identity is satisfied in both cases. To reduce the public debt ratio, the government has to eventually run primary budget surpluses (that is, spend less than they raise in taxes). This question requires you to understand the key parameters and relationships that determine the dynamics of the public debt ratio. An understanding of these relationships allows you to debunk statements that are made by those who think fiscal austerity will allow a government to reduce its public debt ratio. It also requires you to differentiate between the level of outstanding public debt and the ratio of public debt to GDP. The question is focusing on the latter concept. Mainstream economics starts with the flawed analogy between the household and the sovereign government such that any excess in government spending over taxation receipts has to be “financed” in two ways: (a) by borrowing from the public; and/or (b) by “printing money”. Neither characterisation is remotely representative of what happens in the real world in terms of the operations that define transactions between the government and non-government sector. Further, the basic analogy is flawed at its most elemental level. The household must work out the financing before it can spend. The household cannot spend first. The government can spend first and ultimately does not have to worry about financing such expenditure. Further, in mainstream economics, money creation is erroneously depicted as the government asking the central bank to buy treasury bonds which the central bank in return then prints money. The government then spends this money. This is called debt monetisation and you can find out why this is typically not a viable option for a central bank by reading the Deficits 101 suite – Deficit spending 101 – Part 1 – Deficit spending 101 – Part 2 – Deficit spending 101 – Part 3. Hence they say as a better (but still poor) solution, governments should use debt issuance to “finance” their deficits. Thy also claim this is a poor option because in the short-term it is alleged to increase interest rates and in the longer-term is results in higher future tax rates because the debt has to be “paid back”. The mainstream textbooks are full of elaborate models of debt pay-back, debt stabilisation etc which all claim (falsely) to “prove” that the legacy of past deficits is higher debt and to stabilise the debt, the government must eliminate the deficit which means it must then run a primary surplus equal to interest payments on the existing debt. So the change in the debt ratio is the sum of two terms on the right-hand side: (a) the difference between the real interest rate (r) and the real GDP growth rate (g) times the initial debt ratio; and (b) the ratio of the primary deficit (G-T) to GDP. The real interest rate is the difference between the nominal interest rate and the inflation rate. Real GDP is the nominal GDP deflated by the inflation rate. So the real GDP growth rate is equal to the Nominal GDP growth minus the inflation rate. An appreciation of the elements of the public debt ratio immediately tells us that a currency-issuing government running a deficit can reduce the debt ratio. There is no need to run primary surpluses and unnecessarily reduce growth. The standard formula above can easily demonstrate that a nation running a primary deficit can reduce its public debt ratio over time. Here is why that is the case. The following Table simulates the two years in question. To make matters simple, assume a public debt ratio at the start of the Year 1 of 100 per cent (so B/Y(-1) = 1) which is equivalent to the statement that “outstanding public debt is equal to the value of the nominal GDP”. Also the nominal interest rate is 1 per cent and the inflation rate is 1 per cent then the current real interest rate (r) is 0 per cent. If the nominal GDP is growing at -1 per cent and there is an inflation rate of 1 per cent then real GDP is growing (g) at minus 2 per cent. Under these conditions, the primary budget surplus would have to be equal to 2 per cent of GDP to stabilise the debt ratio (check it for yourself). So, the question suggests the primary budget deficit is actually 1 per cent of GDP we know by computation that the public debt ratio rises by 3 per cent. Change in B/Y = (0 – (-2))*1 + 1 = 3 per cent. The data in Year 2 is given in the last column in the Table below. Note the public debt ratio has risen to 1.03 because of the rise from last year. You are told that the budget deficit doubles as per cent of GDP (to 2 per cent) and nominal GDP growth shoots up to 4 per cent which means real GDP growth (given the inflation rate) is equal to 3 per cent. Change in B/Y = (0 – 3)*1.03 + 2 = -1.1 per cent. So the growth in the economy is strong enough to reduce the public debt ratio even though the primary budget deficit has doubled. It is a highly stylised example truncated into a two-period adjustment to demonstrate the point. In the real world, if the budget deficit is a large percentage of GDP then it might take some years to start reducing the public debt ratio as GDP growth ensures. So even with an increasing (or unchanged) deficit, real GDP growth can reduce the public debt ratio, which is what has happened many times in past history following economic slowdowns. The best way to reduce the public debt ratio is to stop issuing debt. A sovereign government doesn’t have to issue debt if the central bank is happy to keep its target interest rate at zero or pay interest on excess reserves. The discussion also demonstrates why tightening monetary policy makes it harder for the government to reduce the public debt ratio – which, of-course, is one of the more subtle mainstream ways to force the government to run surpluses. Should that be in the present vs. possibly not in the future? I’d rather think about it this way. Apple saves $100 for one year in a checking account. The gov’t deficit spends $100 with no bond attached. At one year and one day, there could be $200 in circulation of medium of exchange. I assumed the fed funds rate went to zero and no other reactions to that. That is somewhat unrealistic, but trying to keep it simple. Apple saves $100 for one year in a checking account. The gov’t deficit spends $100 with a bond attached. Apple buys the bond. At one year and one day, there could be $100 in circulation of medium of exchange. I assumed both interest payments and principal payments on the gov’t bond to pay it off (no rollover risk). I ignored the interest payment transfer between borrower and lender. Notice the $200 vs. $100 in circulation of medium of exchange. Q1 & Q2, do most people assume gov’t debt is less price inflationary in the future because they assume most instances of price deflation and/or negative real GDP growth are aggregate demand shocks? Bill, I know you can be sneaky with your wording but it seems to me that, in Question 2, by your own explanation, the answer should be false. It is the deficit that increases non-government sector wealth not the matching of it with bonds. The government has no power to set the overal level of bank reserves independent of its spending, taxing, and borrowing. Reserves are created when the government spends money, and destroyed when the government taxes or issues bonds. The private sector (including the banks) has no power to change the overal level of reserves (except by sticking suitcases of money under one’s mattress) since any time you make a withdrawal to buy something, the seller has no choice but to deposit the money you gave them in a bank, and hence straight back into the total reserves. Attempting to legislate something that people have no control over is pointless. The government can (and does) legislate minimum per-bank reserve requirements, but this is only to keep the payments system running smoothly. Such legislation can only affect the distribution of reserves between banks and not their overal level. Consequently, such legislation could not affect aggregate demand even if bank lending was constrained by reserves, which it isn’t. Bank lending is constrained by the availability of credit-worthy borrowers, and by the capital-qualiy requirements of the Basel Accords. The quantity of the medium of exchange in circulation has no effect on anything whatsoever. For MMTers, this is a statement of fact based on historical analysis, and theoretical models that claim that it should when it clearly doesn’t ( “QV=MP”. “rational expectations”, “loanable funds”) are just so much hot air. This is not to say that government actions cannot produce inflation or other effects; of course they can. It is just that it isn’t the “quantity of the medium of exchange” that matters. For example, inflation occurs when a government through its net spending adds more to aggregate demand than the economy can expand to produce, regardless of the ‘quantity’ of money around. You are of course free to disagree with this or any other assertion of historical fact, but you need to then provide an explanation for why the historical record supports it so strongly. Purely theoretical justifications for why the facts should be other than what they are are not very interesting. The mainstream believes this on the basis of a plethora of elaborate and purely theoretical models that bluntly contradict the actual historical record, and range from the ridiculous to the truly bizzare. If you want, you can spend the time to come to grips with these models and pinpoint their errors, but I don’t reccomend it. Leave that neccessay but pointless work to poor suffering professional MMTers like Bill who are obliged to and at least get paid for it. Do something more productive instead – like watching Get Smart re-runs. The stealing is irrelevant, but the assertion never claimed it was. It’s still true. begruntled, so you are saying raising the reserve requirement (which might have to be by a lot) would not affect the fed funds rate and therefore the demand for credit/debt? I’m not going thru the rest. Some of it I agree with. Some of it I don’t. I’d like to hear what bill has to say about it. The government cannot change the level of reserves by changing the reserve requirement. Doing so can only shift reserves around between banks, and would have no effect on interest rates. It may help to think of bank reserves as just cash (paper money) that banks are legally required to keep in their vaults. The government can require that banks each keep a certain amount in their vaults, but it cannot – except by printing more – change the total amount that is in all the vaults. The government prints money and spends it, at which point – apart from the tiny amount in your wallet – it sits in bank vaults – where we call it ‘reserves’ – until the government taxes or borrows it back. I like to think of my wallet as my own, personal ‘bank reserves’ account with the central bank, which in effect it is. The overal level of reserves is determined by the government’s spending, taxing, and borrowing. Assuming it didn’t change its spending and taxing, the only way the government could raise the level of reserves would be to buy its bonds back; the cash it printed to do so would become new reserves. By raising the demand for bonds this could be expected to raise their price, and consequently lower their rate of return; buying and selling bonds to preserve their market price at a chosen level is how the central bank sets the interest rate. So raising the level of bank reserves (by selling bonds, which is the only way to do so) would, in effect, mean lowering the fed rate. This is what is called ‘monetizing the debt’, or ‘quantative easing’. It has just occurred to me that you might be thinking of the government setting a reserve requirement as a percentage of the banks deposits and at a level sufficient to be a constraint on the banks lending, like they once sort-of did (and as many economics textbooks still describe in their section on the ‘money multiplier’). Nobody does this anymore, but I suppose it could be re-introduced. In such a case, the government still couldn’t affect the level of reserves by setting the reserve requirement, but it could make the level of reserves a constraint on total bank lending. Such a regime would still have no effect on the fed rate (which is set by the government buying and selling of bonds), and I can’t see any reason it would affect interest rates in general, which would still be determined by the bank’s cost of funds. It might lead to banks being more careful in who they chose as borrowers, however! You’ve got me thinking here FedUp – thanks! 3. Choose a level of reserves (and a reserve requirement) that was such that they constrained bank lending to less than what eligible borrowers wanted to borrow. 1. Because of the limited availability of bank credit, bank lending rates would rise to whatever level the economy could withstand (ie at whatever level there were still credit-worthy risks to take). 2. Competing for depositors (to gain reserves and allow them to make more highly profitable loans) bank interest on savings would rise to almost the level of lending rates. 3. Asset prices would collapse (real estate, shares) since everyone would want their money in those high-return savings accounts and not in anything real. 4. If the government wanted to issue bonds it would have to offer a return (the fed rate) at least equal to what the banks did. This would continue until the economy collapsed, there were no longer borrowers who were a good risk for banks to take, and the reserve requirements stopped being a constraint on bank lending. Or, more likely, the government got voted out by irate home owners who couldn’t afford their mortgages anymore. I suspect that is why governments don’t adopt such a policy! begruntled, I was thinking that raising the reserve requirement (on bank deposits) would convert excess reserves to required reserves. Depending on conditions, that could affect the fed funds rate (raise it) and therefore other interest rates. I don’t see that there is any meaningful difference between ‘excess reserves’ and ‘required reserves’, and no reason why making reserves that a bank already has ‘required’ would affect interest rates. Let me try and give an example. For simplicity, imagine there were just have two banks with reserve accounts, A and B. A has $100 in reserves, and B has $200. Lets say the reserve requirement for each bank is $50. Do you see what I mean about the reserve requirement just shifting reserves around? That shortage of (central bank) reserves would show up in the fed funds market as a rising fed funds rate. One thing that could happen is that the central bank can now supply (central bank) reserves at the price (interest rate) it wants. Therefore, they “regain” control of the fed funds rate at the higher rate they want. Aha! I think I get where you are coming from. But the government doesn’t want to raise the interest rate; in fact it has set it to an all-time low. It does this by buying bonds whenever the rate goes up, and can do so – and achieve any (non-negative) interest rate it wants – regardless of what the demand for reserves (or bonds) is, simply by changing how many bonds it buys and sells. Another way of thinking of bank reserves is that they are just treasury bonds with a 0% interest rate. So what your suggestion (I think) really amounts to is that the government could, for a given desired non-zero fed rate, incur a lower interest bill by legally requiring some people (in this case banks) to purchase a given quantity of 0% bonds, regardless of what the actual market rate was. This is quite true, and is not a bad way of making the point that the governments choice to pay ‘interest’ on its debt is essentially voluntary. The government can, of course, stop paying interest on its ‘debt’ simply by printing money. But your suggestion is an intriguing way of maintaining a non-zero fed rate while not actually paying any interest. However I think the banks might complain – why, they would say, do we have to buy interest-free bonds when other people can buy interest-bearing ones? And I suspect there would be all sorts of unpleasant side effects. In general, however, the challange for governments is to lower the interest rate, not raise it. This was one of Keynes’s fundamental points; the market tends to set interest rates too high, not too low.. Which was the whole point of asking why not raise the reserve requirement. It seems to me that is possible. It seems to me that is true. I can just hear jamie dimon complaining at a fed press conference about that lowering his bank’s profitability and that constraining lending. Inflation (defined as a rise in the price level) is not caused by excess aggregate demand. If that were the case then interest rate increases coupled with budget deficits would make the inflation problem worse instead of better. Inflation is caused by the non-productive use of debt. This is why wars tend to be inflationary – because governments fail to raise taxes to pay its employees to embark on a destructive endeavor. Instead they turn to the monetary authority to chip in. Inflation is not a rise in the price level. Inflation is the continuous rise in the price level. A once-off increase in the price level is not inflation. We should get our definitions correct before we start making assertions. But the commercial banks net position would be zero in this case because the current and future value of its assets and liabilities would always be equal. What you failed to include is that no commercial bank would participate in this arrangement because it would be nonprofitable. In the case of bond issuance, as long as the yield curve is sloped positively, a commercial bank can borrow short from the fed’s discount window (or from noninterest bearing deposits) to buy longer dated debt and pocket the difference. The U. S. Treasury does not issue debt for the explicit reason of maintaining an interest rate target. If they did then they would never need to issue marketable debt and there would be no reason for federal reserve open market operations. The U. S. Treasury sells debt to finance the budget deficit. The federal reserve does not require marketable government debt to hit an interest rate target. They could just as easily announce what the discount window rate is going to be without any buying or selling of liabilities (government or otherwise). And so inflation is caused by productivity not growing as fast as money velocity. Why might that happen? Because a government or an individual enterprise (or both) may decide that non-productive ventures (like wars and commodity speculation both financed with debt) are “good ideas”.